As many as one-fifth of the private wells in New Hampshire may contain arsenic concentrations above a new standard being proposed by the Environmental Protection Agency (EPA)5 parts per billion (ppb)and many are above the current standard of 50 ppb. That was the conclusion of a recent Dartmouth study analyzing the state's water records. "New Hampshire is one of the sites in the country where there is very high arsenic [occurring] naturally in the drinking water," says Joshua Hamilton, Ph.D., an associate professor of pharmacology and toxicology. He is the director of Dartmouth's new Center for Environmental Health Sciences and of its Toxic Metals Research Program. Under the program's aegis, researchers from several DMS and Dartmouth College departments are collaborating with each other as well as with state and federal agenciesto investigate the problem of arsenic in New Hampshire's drinking water. 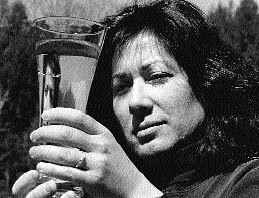 Risk: Exposure to high levels of arsenic in drinking water from 500 to 2,000 ppbin places like Taiwan, India, and South America has long been linked to an increased risk of skin, lung, and bladder cancer, as well as of cardiovascular disease and diabetes. "What isn't clear yet is whether the slightly lower exposures we have here in the United States, even in places like New Hampshire, are also associated with risk," Hamilton says. Right now, the 50 ppb U.S. standard is five to ten times higher than the standard in most of the Western world. Epidemiologist Margaret Karagas is one of a number of Dartmouth researchers investigating arsenic; she's looking to see if there's a connection between cancer rates and levels of the toxic metal in drinking water supplies. Margaret Karagas, Ph.D., an associate professor of community and family medicine, is doing the first-ever epidemiological study of the effects of arsenic at levels between 5 and 50 ppb. Using the New Hampshire Cancer Registry, she is determining whether the levels of arsenic in individuals' drinking water, and the amount of arsenic in their bodies (measured by how much of the toxic metal is in their toenails), have an effect on the incidence of cancer. Biologists Carol Folt, Ph.D., and Celia Chen, Ph.D., are among "the first people to look at toxic metal movement up through aquatic food webs in a systematic way," Hamilton says. And chemistry professor Dean Wilcox, Ph.D., is looking at the interactions of toxic metals with cellular proteins. Hamilton himself is looking at arsenic as an endocrine disrupter. "We think that this may be one of the ways that arsenic contributes to cancer as well as to cardiovascular disease and diabetes," he says. At doses of only 5 to 50 ppb, arsenic can shut off the glucocorticoid receptor, which regulates glucose levels and plays a role in embryonic development, cell differentiation, and cell growth. And Aaron Barchowsky, Ph.D., an associate professor of pharmacology and toxicology, is looking at arsenic's role in vascular disease. Carl Renshaw, Ph.D., an associate professor of earth sciences, is working with Joel Blum, Ph.D., formerly at Dartmouth but now at the University of Michigan, to understand the chemistry and geology related to arsenic in groundwater systems. "Joel Blum's study was one of the first indicators we had that arsenic in New Hampshire and Maine principally comes from natural sources," Hamilton explains. People had previously blamed high arsenic levels on arsenical pesticides, once used in apple orchards, and on pollution from factories and smelters. Earth sciences professor Page Chamberlain, Ph.D., and an army of students have slogged through library stacks and town records to find out where old arsenic mines are. In the 1800s, arsenic was mined heavily in New Hampshire, which "was known as the 'arsenic state,' because we were the single most important source of arsenic for the country," Hamilton says. The Toxic Metals Research Program has been working with the nationally recognized Montshire Museum of Science in Norwich, Vt., to develop a hands-on middle-school curriculum. The program plans other outreach efforts as well. Model: Hamilton hopes the arsenic initiative will serve as a model within the Center for Environmental Health Sciences for other multidisciplinary efforts. The center also plans to create a training program for undergraduate and graduate students and postdoctoral fellows, in order to "foster training, mentoring, and research opportunities for young scientists who are interested in interdisciplinary studies related to the environment and human health. "[Students] want to work at these interfaces and do this new kind of science that isn't along traditional boundaries," Hamilton adds. "They want to do something that they feel has an impact on society." If you would like to offer any feedback about this article, we would welcome getting your comments at DartMed@Dartmouth.edu.